Region Four Chairman Ms Genevieve Allen is on the Minister’s immediate left followed by Mr Earl Lambert, her Deputy. The Diamond Diagnostic Centre and C.C. Nicholson Hospital at Nabaclis, East Coast Demerara will be upgraded to Regional Hospitals under a two-year plan to lighten the current burden on the Georgetown Public Hospital Corporation (GPHC) the country’s sole referral hospital. The improvement plan will be backed by the Inter-American Development Bank (IDB), the Pan American Health Organisation/World Health Organisation (PAHO/WHO) and funding from the local treasury, Public Health Minister Volda Lawrence said when she met recently with Councillors of the Region Four Regional Democratic Council (RDC) at its Triumph, East Coast Demerara head office. The Ministry of Public Health said the multi-million dollar transformation plan is to commence early 2018 following a soon-to-be-signed tripartite Memorandum of Understanding (MOU) among the Ministries of Public Health and Communities and the Region Four (Demerara/Mahaica) RDC. Minister Lawrence who unveiled the proposed pact said to be in its “embryonic stage” explained that upgrading the two health institutions is necessary to help remove some over-work from the GPHC institution, minimise the likelihood of errors made by fatigued hospital staff and enable better daily manage of the tertiary health institution. It is also necessary, Lawrence emphasised, because “everyone wants to live in Region 4 and the problem (of overcrowding at the GPHC and exhausted staff) is not going away. It is growing”. “It is a well-known fact that the GPHC is over-run by patients from all 10 Administrative Regions” Lawrence said. She said the GPHC attends to some 30,000 patients annually while the number of beds at the tertiary health institution declined from a high of some 1,800 to only 440 currently. The GPHC’s inability to attend to the swell in patients is also reflected in the Accident and Emergency (A&E ) Unit which has only 18 beds to cater for men, women and children, the Minister said. She said “because of these shortcomings the MOPH thinks it is prudent to upgrade the two primary health institutions on the East Coast and East Bank to cater for victims of road accidents, violent crimes, domestic and intimate partner violence and other types of crimes in Region 4 which boasts the highest figure in every category of violence. “This is so because Demerara/Mahaica is the most populated Region in the country,” Lawrence reasoned. The upgrading plan is also to fulfil its “good life” promise and vision to the nation which the APNU/AFC coalition campaigned on during the 2015 elections campaign which saw it deposing the Peoples Progressive Party Civic (PPP/C) coalition after 23 continuous years in office, Lawrence said. The improvement plan for the two primary health institutions needs the multipartite accord since responsibility for the health sector is spread among the 10 Regions and the Ministries of Community and Health. 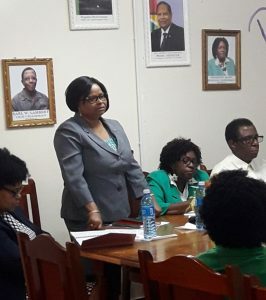 The three sides held talks earlier to find common ground to help transform the two institutions and “after lengthy discussions I thought it was prudent that you the representatives should be brought up to date about the plans by the MOPH” Region 4 RDC Chairman, Ms. Genevieve Allen told Councillors at the specially-held recent meeting addressed by Minister Lawrence. All Region 4 Councillors are backing the government’s health vision with PPP/C Councillor and its RDC Chief Whip, Desmond Morian, dubbed the plan as “timely (and ) the way to go” In return for their support, Morian wants Lawrence to provide documentation so that she becomes “answerable and accountable for what she has promised”. New housing programmes on the two corridors have contributed to increasing pressures also faced by the Diamond Diagnostic Centre and C. C. Nicholson Hospital, and under the improvement plan the IDB, PAHO/WHO and government backing will help bolster physical infrastructure, hiring of new staff and other key planks under the health accord to have the two institutions “running on a 24-hour basis” Lawrence said.